Sealing your crawl space eliminates vapor and energy problems that lead to mold, high utility costs, and uncomfortable rooms. If you have an unsealed crawl space, the area is exposed to temperature changes and moisture from the outside. This can lead to a number problems in the home, including high heating and cooling bills, uncomfortable rooms over the crawl space, and mold and pest issues. The solution to these problems is crawl space sealing and insulation. Woods Basement Systems, Inc. are the local crawl space contractors specializing in crawl space encapsulation, and we can help you get the right solution for your home. Our patented products are designed to eliminate energy problems and moisture in crawl spaces, ensuring a clean, healthy, and efficient space. Contact us today for a free quote on crawl space sealing and insulation in O' Fallon, Belleville, Florissant and the surrounding areas. By sealing, insulating, and dehumidifying a crawl space, you eliminate their entrance points into your home and remove the life-sustaining moisture that otherwise keeps them living and breeding. Our systems can be quickly installed in your home -- with most taking a day or less to install. Our experts will inspect your crawl space and recommend the right solutions for your needs. No matter what you need for your home, we have a warrantied solution that's great for you! 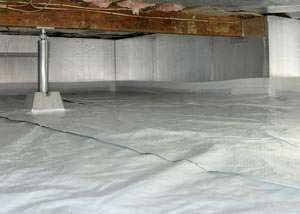 An unsealed, uninsulated dirt crawl space is guaranteed to create home energy comfort problems. As the local crawl space repair contractors in Illinois & Missouri, Woods Basement Systems, Inc. can provide you with complete solutions to these problems and ensure your home is comfortable and efficient. Call us today at 1-844-204-8198 or contact us online to get started with a free estimate on our crawl space sealing and insulation services. We provide quality crawl space encapsulation services in O' Fallon, Belleville, Florissant, Decatur, Ballwin, Belleville, Champaign, St. Peters, Saint Louis and nearby.